Do you know how many games there are on Steam? A lot. And there are a lot of demos out there, too, so many that you could use them to blot out the sun. Assuming the sun could be blotted out by game demos stored purely on hard drive space. That metaphor got a bit tortured, but I checked; at the time of this writing, there are 407 demos on Steam. So I’m grabbing one at random and playing through the demo, no matter what. This week, I rolled 249, which set me up with Alien Breed 2: Assault. The title does not exactly inspire visions of breathtaking originality, but a stupid title doesn’t make for a bad game. So after Steam’s usual ridiculously complicated initial setup process, it was time to jump in and see about shooting the heck out of some aliens. No, I hadn’t really looked at the description on the store page, but be fair; with a title like that, there was only one game this was ever going to be. Yes, it’s a third-person shooter in which you blow up a whole lot of aliens that look like nothing so much as oversized insects. What is a little more unusual is the fact that it eschews the far more popular over-the-shoulder camera view for a top-down view. The result is that the whole thing feels like more of a throwback to classic titles like Smash TV and its associated clones. 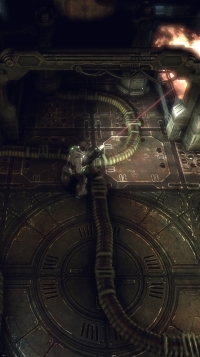 It does still include a camera rotation, which can be accessed via the Q and E keys by default, or by moving your targeting cursor to the edge of the screen (WASD moves and the mouse aims, which you likely guessed as soon as I mentioned it was a third-person shooter on the PC, because how else would those controls work). The demo kicks off with your player character, Bald Squarejaw or John Alienbreed or whatever his name is (the store page informs me it’s Conrad) on a spaceship where a thing happened and… yeah, you’re already picturing this, aren’t you? Dude With Gun plus Decaying Space Thing plus Alien Bugs and now you make with the shooting. This is not a game drawing upon a deep well of narrative vitality, which makes the game’s insistence on adding in cutscenes here and there seem almost entirely pointless. I know this genre quite well, I get what you’re doing here, and I’m not even offended or bothered by the fact that the game’s plot could be written by a twelve-year-old boy. That’s fine. You’ve established your goals, just let me work through them. You knew the entire game looked like this from the moment you saw the title. Do not lie. So you’re on the ship, you get a brief tutorial about how to move and such, and then within a couple of screens you start being set upon by aliens. Which brings a small problem to light. Remember how I mentioned that moving the mouse to the edge of the screen results in scrolling the camera around? That’s something you do not want to happen when you’re hosing down a particularly nasty critter who wants nothing more than to pull your neck off of the rest of your body, since it will result in you aiming off to one side at the worst possible moment. It’s also something that happens repeatedly whilst you’re in the middle of the game’s larger firefights, especially if you’re moving around a lot. Oddly, it’s just the scroll effect that’s problematic here. Your default gun, much to my joy, feels solid without overpowered. Aliens require several rounds to be dispatched, but your rate of fire is high enough that they fall without too much protest, and a few stray bullets don’t sentence you to death. Aliens die around you in suitably screeching fashion, and weapon upgrades (you knew there would be weapon upgrades) are satisfyingly chunky. You can also buy more ammo for your guns at the upgrade stations, a feature I greatly appreciate, even though the demo at least was not particularly stingy with additional rounds and the price for more is almost trivial. What keeps coming to mind is the word functional. The game doesn’t ever particularly grip you by the throat and say you must keep playing, it’s very much an exercise in painting by the numbers, but it paints those numbers well if not particularly artfully. Unfortunately, that wonky scroll issue becomes a major problem when you jump into a turret, which for some reason shifts the game into an over-the-shoulder view and features hypersensitive turning if you so much as nudge the mouse to one side or the other. Instead of the usual fun of mowing things down whilst in a stationary turret, it winds up being an exercise in frustration with no visible indicator of health and nothing to do but just trying to mow down enough aliens that the game lets you move on to the next point. Equally jarring are the cutscenes. Normally, the game looks good enough, with chunky character models that take up enough space to be recognizable and not so much space that the screen feels bloated. I’m reminded of the models from Warcraft III, designed to look good at a variety of scroll levels in play. Unfortunately, the models in that game looked kind of hopelessly bad in cutscenes, and the feeling is much the same here. Even disregarding the complete lack of drama in the game’s excuse plot, cutscenes looked like action figures being thrown about in a vague attempt at drama, feeling silly more than anything. They also can’t be skipped, which is an atrocious sin. One last point: the title of the game obviously implies the existence of an original Alien Breed. What I didn’t expect was the existence of an Alien Breed 3 as well, raising the question of what creative questions were left unanswered by the previous two installments. The whole thing was released over about six months in 2010, giving cause to wonder why the game was split into three parts instead of released all as one. Sure, I suppose you could argue that $30 is too high a price tag, but at the same time I don’t think I’d be purchasing all three games anyhow. Perhaps you have a larger need for alien shooting than I do. I’m sure I remember Alien Breed being a thing back in the early ’90s. Is this a reboot? It is a sequel to a reboot, yes. Anyway, I hope you end up doing The Stanley Parable Demo at some point. Even if you have the full game, the demo is its own experience. I kept waiting for the R.E.M. reference.